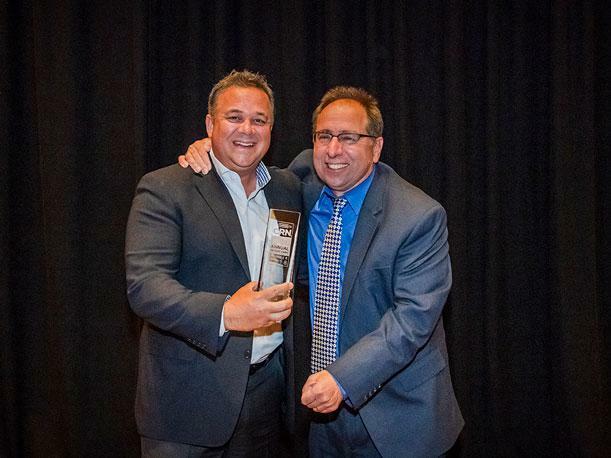 Curtiz Gangi, Vice President of North America Mid-Market Sales, accepted the award from CRN Executive Editor, News, Steve Burke. Eaton is honored to have been recognized as an Overall Winner in the Power and Protection Management category of The Channel Company's CRN® 2018 Annual Report Card (ARC) awards program. The ARC summarizes results from a comprehensive survey that details solution provider satisfaction across product innovation, support and partnership for the hardware, services and software vendors they team up with. The vendors with the highest ratings are named to the prestigious ARC list of winners. This year’s award is especially meaningful because it shows Eaton’s commitment to the channel is felt by our partners. We continue to innovate within the Power and Protection Management category with our PowerAdvantage® partner program and Intelligent Power Manager software, but most importantly we have a sales team that is exceptional; they’re committed to going above and beyond for our partners. It's Eaton’s dedication to helping partners succeed that is valued most. We provide training, financing and sales enablement support to ensure that each of our partners can enhance their power management sales and in turn grow their business.